I KNEW word was spreading about my London Triathlon bid, but well, this was ridiculous. I ventured off to Watermeadows in Mansfield for a spot of “tuition” from a colleague to try and speed me up a bit in the pool. As I waited for him I went through a few warm up laps, only to notice a good 50 people sitting in the spectator gallery to my left. Wow. This lot turned out for me? Obviously not. It was the parents of loads of youngsters from Sherwood Swimming Club, having their class in the far three lanes. Like machines, they flew through the water at pace, making it look effortless while racing a breakneck speed. Oh dear, I thought. For I had to position myself in the slow lane, next to the spectators, and soon I became a little unnerved. Their kids looked like professionals, gliding through the water yet there I was, a grown man, about to get a few front crawl tips to try and put come lengths without passing out. 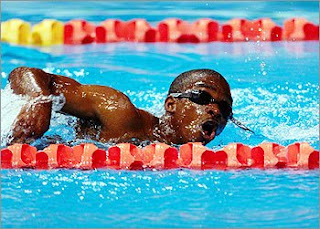 Now, breaststroke, I am comfortable with any day of the week. Freestyle, well, that is another story all together. So when my tutor for the evening arrived, sports colleague Matt “Phelps” Halfpenny, I was in trouble. Gurgling, forgetting when to breathe, I looked more like Eric the Eel (top and right) from the 2000 Sydney Olympics than somebody a few months away from kicking off the London Triathlon with a 1,500m open water swim. I was glad when the kids from Sherwood vacated the pool, their parents no doubt wondering who the hell was making a splash for all the wrong reasons in the slow lane. It was clear, I have a long way to go to be able to swim with the finesse of those teenagers. With the few pointers picked up from Matt, I now have a good four sessions a week pencilled in for my local pool. I need to nail this. And I am about to embark on a few classes with newly-formed local club Absolute Triathlon. I am now under no illusions. Those kids make it look easy through years of practice. As for me, I will be happy to be able to put in a performance that ensures I just go unnoticed, slipping under the radar of the spectators in London. The last thing I want is to become the Eric the Eel of London. Visit www.justgiving.com/stevieroden to sponsor Stevie. Stevie Roden - Rookie of the Year?